Ruben's Baseball: What to do when it rains? Play! I love baseball. I used to play and coach, and now I watch – both as a fan and parent - and I umpire games too. I would to go to a game every day if I could. But living in Alberta, the weather isn’t very co-operative. 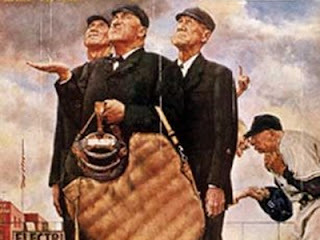 We only have a few months where baseball can be played, and have to deal with our share of rainouts (and snowouts, hailouts, lightningouts… you get the idea). So what to do when it’s winter, or you have an unexpected free evening in the summer and you can’t get to the ballpark? The next best thing is to play a baseball simulation game. When I initially got a PC one of the first programs I installed on it was Earl Weaver Baseball. I thought this was the best baseball simulation game that could ever be made. I could set up lineups and make trades. How could a game possibly ever be any better? (At the same time I thought that an IBM XT PC with 640 K of RAM was more than I could ever possibly need. After all, I wasn’t NASA- why would I ever need a whole MB of RAM on my home computer? But I digress). Well, comparing the latest version of OOTP to this initial baseball simulation game would be like comparing PONG to Call of Duty. Sure they’re both video games, and you can control what you see on the screen through some type of interface – but that’s where the similarities end. I did a very quick summary of how much I liked this game the night I got it, and now that I've played it for a bit, I thought I'd expand on my initial review. With OOTP 12, you not only get to set your team’s lineups, but pretty much everything else that a real live GM needs to deal with. In fact, if I was a baseball owner looking for a new GM, I might skip the interview process and judge the applicants on how well they do playing this game. Setting your lineups, pitching rotations and bullpen roles are just the tip of the iceberg. You not only draft players, but you decide where to spend your scouting budget on. Do you want to just concentrate on the typical baseball hotbeds, or do you want to spend a little bit of money scouting in, say, Portugal, so you get a leg up on competition if there’s any talent there? You have to keep your eyes open on waiver wires, be careful who you try to sneak past them to send to the minors lest they be stolen from you, and deal with contract negotiations. The game is flexible enough that you can bypass all of these details, and simulate a season fairly quickly, or you can literally take hours to simulate a single day. I initially played a quick season, recreating my childhood 1975 Red Sox pennant winners, to see if I could get a different outcome. In the simulation they won their division and had to face the A’s in the playoffs, just like in '75. However, there is a limit to how much the game mimicked real life events, and in this simulation Vern Ruhle did not break Jim Rice's wrist which a lot of fans think would have been the difference between winning and losing that Classic Series to the Reds. Alas, the A’s beat us in the ALCS and I didn’t get a chance to recreate history against Cincinnati. I then played the 2011 season in detail, as the Sox GM and took care of every detail. John Henry’s expectation was to win a Championship and when the team was floundering into June, he was unhappy and I felt the pressure and was worried I was going to get fired. I made a series of moves – which may have depleted my farm for the future – and managed to win the pennant, and save my job. This game lets you play a virtual infinite number of different modes. You can set up your own leagues and teams. Realign divisions and change rules. I could do an expansion draft and bring the Calgary Vipers and Edmonton Capitals into the league and see how long it would take me to make those teams competitive. Now that I have OOTP 12 installed, instead of dreading any upcoming rainouts, I might secretly be hoping for them, so I have more time to play! Take a look here for more information on the game and how to buy it.